It seems a bit odd to me to go all conspiracy theory on this story… I mean, wow, they added some stats and some quotes, re-worded some stuff slightly and posted a different story on a different paper’s site. Isn’t shuffling phrases, inserting and removing information and quotes something that writers and editors do? 1. the writer had materials that he would have included given the time, which they then decided to allow before the second posting. 2. the editor didn’t like all of the pure opinion writing and wanted some more stats and quotes to ground things in reality, present a broader picture and show consultation with both camps. Storm in a tea-cup – shame people are referring to this to support arguments. Steele – the bit about “the NYT editors did not want you to see” shouldn’t be taken as hint of a conspiracy. A conspiracy would have involved the original version not being printed in the first place. When I wrote “the NYT editors did not want you to see” the original version, I did mean it literally. In fact, the article had been ready, at least since around noon EST on Monday 1 (when the IHT was finalized for production), but was nowhere on the website until around the early hours of Monday 3, again EST. Somebody in the editors’ team decided they did not want people to see the IHT version, and in fact, AFAIK, it only exists on the ‘net in the two images I have posted in my blog. In the past I have seen NYT articles appear slightly shortened next-day on the IHT. I have also seen web articles change (albeit not as much as the one we are talking about). This is the first time I have seen a printed article not appear at all until heavily edited. Perhaps you might agree that it looks rather odd that an article written by a New York-based resource and approved and edited enough to appear on the front page of the Paris-based IHT would suddenly be unworthy of publication in the New York-based NYT website. And this brings me around to ask you…what was so wrong in the original version, wrong enough to prevent its publication? It was hardly a Monckton-style piece, was it? I would HOPE that U.S. readers would send links to articles like this to the PBS Ombudsman and ask WHY the PBS NewsHour has censored all the global warming news since [and before] Climategate. I digress so as to get down to the essence of the issue.The rigors of scientific discipline demand,inter alia,that a theory imply the kind of evidence that would prove it wrong.Predictions based on the theory are checked against the facts.If something occurs that should’nt have,and vice versa,the theory is discarded.The principal AGW alarmists themselves lament that they cannot explain the lack of warming.Ergo the AGW theory has been discredited.Einstein said that it would not take 100 scientists to prove him wrong.One fact alone would suffice.So be it.The onus of proof lies on those who postulate the AGW theory.I don’t have to prove or disprove anything.Those who call themselves scientists do not appear to be awre of the principles elaborated above.The comprehensive rejection of the Emissions Trading Scheme in the Australian Parliament clearly demonstrates that the public has had enough of the lies,cheating,filibuster .spin and obfuscation.BTW a sceptic is defined as one who does not accept or reject a proposition without critical rational analysis. Ah. Thanks, you appear to have no actual evidence for your ‘first time ever’ claim. Same with ‘never, ever, ever happened’. This being my blog, my experience is all the evidence I need until proven wrong. I don’t think anybody can see any problem with the original or final version. Can’t you see, that is the issue here. Why go through all that effort, when the article was ready and printed??? What was so wrong in the original version, wrong enough to prevent its publication? (rather than, for example, publish it in one version and then change it to another version later in the day). BTW, regarding climategate, I was wondering what you thought of Jeff Id (The Air Vent)’s discovery that the government office claiming prosecutable misconduct on the FOIAs is the same office that advised them not to comply with the FOIAs in the first place. 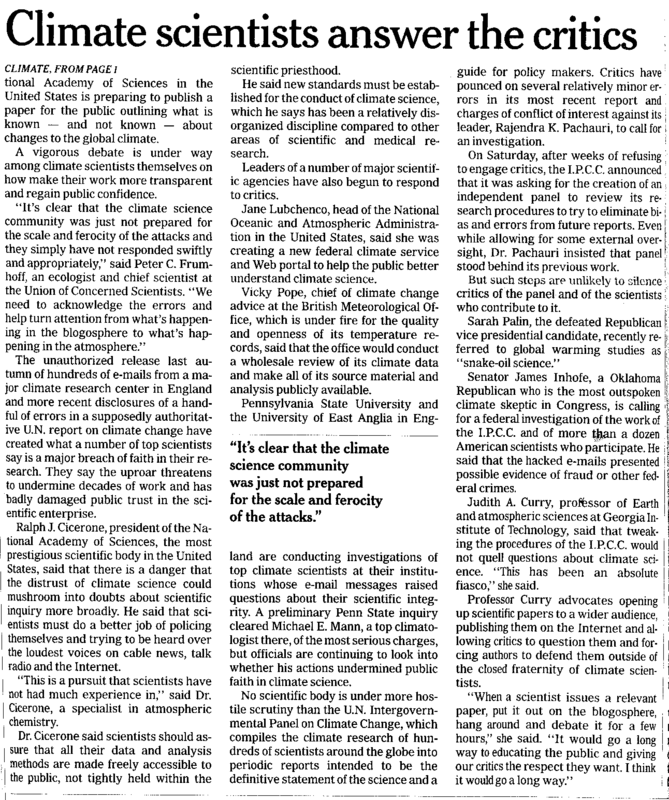 The second article has Eschenbach, who’s every bit as crazy as Palin or Inhofe – what’s the problem? Outdated use of “crazy”, cmb: when it comes to craziness, those who manifest, say, Palin Derangement Syndrome set a nearly unapproachable standard for being “crazy” – with my respectful apologies to Al Gore, of course, who is without question in a class of super “crazy” perhaps thus far all to his own. So apart from those kinds of “craziness”, the term can hardly even be applied anymore. The thing to remember here, of course, is that my description of Sarah Palin’s behavior is quite literally correct, no derangement required. Her record of outright lies on almost every social or scientific issue she touches speaks for itself, loudly. However, she seems to have abandoned the people of Alaska in favor of a showbiz career at this point, which will make her a minor player. I don’t see much evidence these were intended to be the same article – almost all the text is radically different. Apparently differing editorials there are already a tradition, bringing your ‘first ever’ claim into question. cmb – thank you again for proving the point. We have two articles by the same journalist about the same topic, with large parts using the same words down to the punctuation, and still they are so completely different that they may as well be taken as two different articles (ask Broder if you’re in doubt). They provide a glimpse in what goes through the different Editors’ minds. And so we are back to the point…what was so wrong in the IHT version that made it unacceptable to the NYT editors, to the point of preventing its publication on the website until heavily changed? Keep in mind that the lifecycle of a IHT article usually involves publication on the NYT website and/or paper version, then next-day printing on the IHT, most of the time a slightly shortened version with its own title different from the original. I have been reading the IHT since 1985, and since the day it was bought in full by the NYT I have regularly used the latter’s site to read the “extended” versions of the IHT pieces, so I have plenty of personal evidence that indicates this is the first time ever anything like this has happened. And yes, I have seen articles change between the website and the print, but an IHT article that doesn’t appear in any form on the NYT website for 24 hours, that has never, never, never happened. With Sarah Palin and James Inhofe held out as persons of interest with no mention of their long record of lying outright about the issue, I myself see no problem with the edit. I suspect the author didn’t want to muddy the article with all that, which he would have to do in the interest of fairness. You don’t say what your actual problem is with the edit? I see no evidence of bullying on the part of the NYT, only an adherence to facts. Proof otherwise is welcome, of course. I don’t really see the controversy – why didn’t they just publish the versions that you’ve scanned in? beats me Jamie. They actively stopped the article from going to the website, hatcheted it around, mixed it up, called at least two more interviewees, picked up Eschenbach’s words….why?? What is so wrong in the original (printed) version? We can only guess. The main difference I can see now is that there was no word from GISS or the UGS, and there was instead plenty of prominence for Prof Curry. Overall, it was probably not of Joe Romm’s liking. 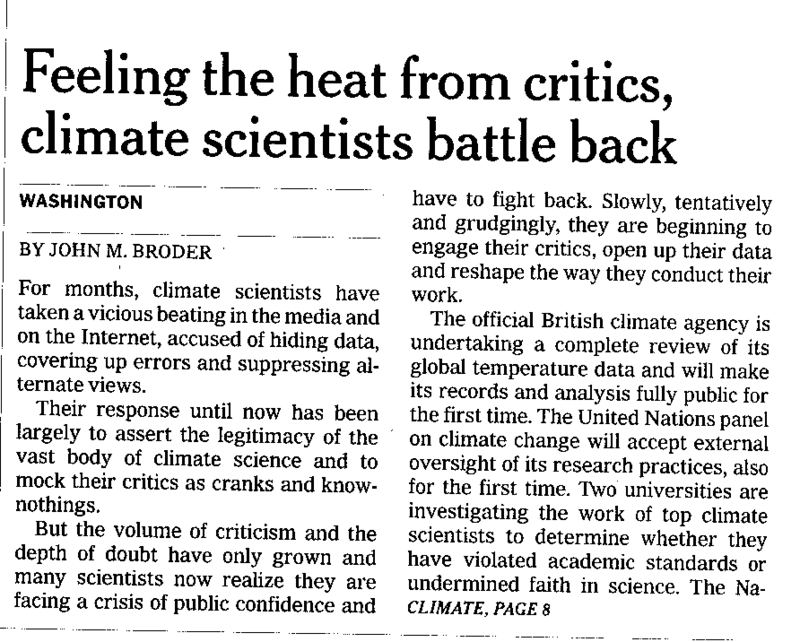 Previous Post: "'Tis But A Scratch…"
Next Post: New Scientist: "Why Scientists Must Be The New Climate Sceptics"